If it looks like a duck and acts like a duck then it's probably a duck. Overall, our quiz bird looks dark and nondescript; the only outstanding field marks are the white line behind the eye and the white ring around the neck. There aren't too many ducks with a white line behind the eye. Adult male White-winged Scoters have a small sliver of white surrounding each eye, not the prominent slash of our bird. Also, the bill on our candidate seems too short and stubby for a White-winged Scoter. A male Garganey would also have a white line behind the eye, but the bill on our bird is all wrong for a Garganey (or any other puddle duck for that matter). A female, immature, or eclipse male Wood Duck would show a crest on the head and a thinner bill. Young male King Eiders can have a white line behind the eye, but it wouldn't be as thick as on our quiz bird. So what does that leave? Well, a duck in a plumage we almost never see here in the Midwest, that is, a female Long-tailed Duck, formerly known as Oldsquaw. The female Long-tailed Ducks we see in the Midwest in the fall and winter have a white head with dark spots. 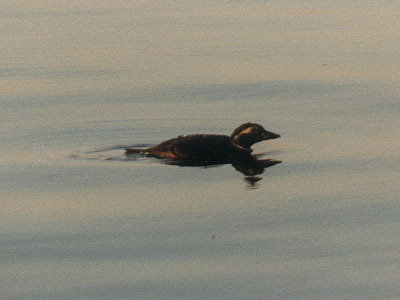 This female Long-tailed Duck was photographed at Churchill, Manitoba in June of 1986 by William Hughes.